Pegasus is a winged white unicorn and Helios is the priest of Elysion. Pegasus and Helios are two separate characters in the manga, but in the anime they are the same. In the manga, Nehelenia curses Helios into the body of his favorite horse. Thus, Helios is forced to appear to Chibiusa in this form. He is seen riding on Pegasus, separate from the body of his favorite horse when he says good-bye to Chibiusa. Unlike his anime counterpart, Helios also lacks any sort of definitive power. He does not lend power to anyone to do attacks, nor can he physically change form himself. He can only transport himself between worlds and fight the curse put upon him. While he guards the Elysion, he does not guard the Golden Crystal directly. He is aware of the existence of it, but it is not in Pegasus's horn, but a part of Mamoru that only Mamoru can wield. In the anime, Helios plays a major role in the fourth series of Sailor Moon, Supers. He becomes Pegasus after being captured by Nehellenia in order to search for a pure dream to live in and takes up residence inside Chibiusa's beautiful dreams. He willingly takes the form of Pegasus leaving the shell of his body behind. Pegasus becomes a friend and companion to Chibiusa. He has to keep some secrets from her at first, but as the series progresses they get to become closer than friends as they share a kiss and a hug in the anime. He protects the Golden Crystal which is on his forehead, this is eventually used by Sailor Chibi Moon rather than Mamoru at the end of the arc. Pegasus lends his power to Super Sailor Moon, for use in attacking Lemures, once he has been summoned by Super Sailor Chibi Moon. 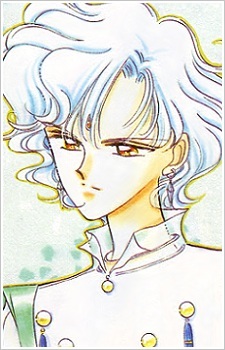 In the manga, it is strongly implied that Helios will eventually marry Chibiusa and become her "prince."